From left: Peter Keller, EVP of TOTE; Congressman Duncan Hunter, Walter Tschernkowitsch, Manager, General Dynamics NASSCO Steel Dept. 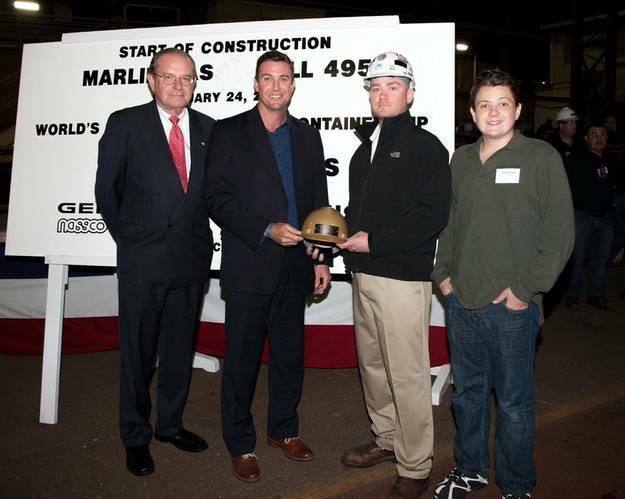 and Duncan Hunter, Congressman Hunter's son who did the honors of making the first cut of steel on TOTE's new Marlin Class hull #495. Fireworks marked the first cut of steel in a ceremony last night as construction of TOTE, Inc.’s new Marlin Class, the first liquefied natural gas (LNG)-powered containership in the world, began at the General Dynamics NASSCO shipyard in San Diego, Calif. The Marlin class vessels mark a new age in American shipbuilding. TOTE’s back to back announcements in 2012 - converting its existing RO/RO fleet in Alaska and investing in new containerships for the Puerto Rico trade, began what can only be described as a change of tide in the U.S. maritime industry toward LNG as the new maritime fuel. The Marlins, which will home port in Jacksonville, Fla., will enter service in late 2015 and early 2016. TOTE recently announced it entered into an agreement with Pivotal LNG and WesPac Midstream to provide LNG to the ships.